This boulder (approximately 6 meters-wide) had come to a stop at the bottom of the sloping wall of an impact crater. 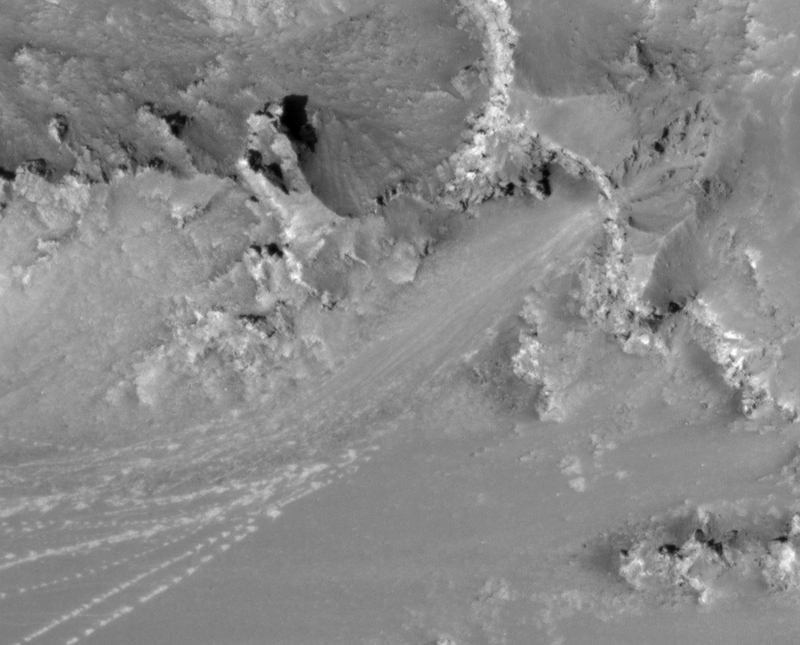 The path the boulder took is obvious as it left a series of prints in the Martian regolith as it bounced and rolled. The darker material that appears to have flowed around the rock is relatively fresh dry dust and sand that has also been dislodged from the top of the slope, falling as an avalanche, settling as a dark streak. As time goes on, the streak will age and blend in with the surrounding regolith. It is suspected that seismic activity or a weather event (such as a dust devil) may have triggered the avalanche. As for the boulder, it looks like it rolled down the slope before the sand/dust avalanche, so it may have originated from the same destabilization event, or it happened earlier. As the source of the streak and boulder appear to originate from the same location, I suspect the former might be the case. Regardless, it goes to show Mars is still active, and the MRO is in the perfect location to capture the Red Planet proving that fact. This image looks like the frosted top of an over-baked muffin, but it’s actually the side of a crater on Mars covered with ice. Taken by NASA’s Mars Reconnaissance Orbiter (MRO) High Resolution Imaging Science Experiment (HiRISE) over the Martian south pole, this example demonstrates an active process of weathering acting on the red landscape. 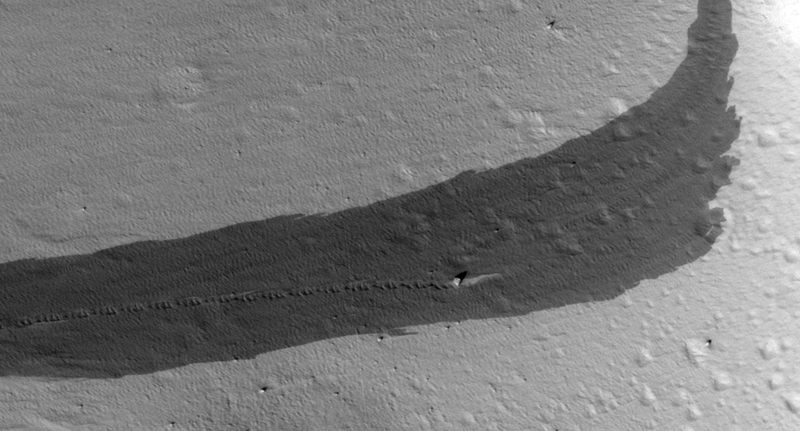 According to the HiRISE site, the ice layer is approximately 3 km thick. In regions situated closer to the equator, craters aren’t open to erosion by ice (not surface ice in any case), but in polar regions it’s a different story. Due to the Martian thin and cold atmosphere, water ice rarely melts into a liquid; it bypasses the liquid phase and turns straight into a gas. This process is known as sublimation. There are terrestrial examples of sublimation too, including frozen carbon dioxide (or “dry ice”) which sublimes at room temperature, generating a carbon dioxide vapour. For this particular crater, it is obvious where there is a higher rate of sublimation than others. As the Sun illuminates the crater edge from the bottom right, the rim of the crater receives the most sunlight, heating up the darker regolith and causing more ice loss. The large cracked-like structure within the crater is most likely a combination of darker material under the ice receiving preferential heating and shrinkage of the subliming ice pack. This seasonal freezing of water vapour and sublimation of water ice erodes the sides of these polar craters, wearing them down season after season. I never tire of seeing HiRISE images of the Red Planet, especially when they include active atmospheric processes that continue to shape the landscape of this alien world. 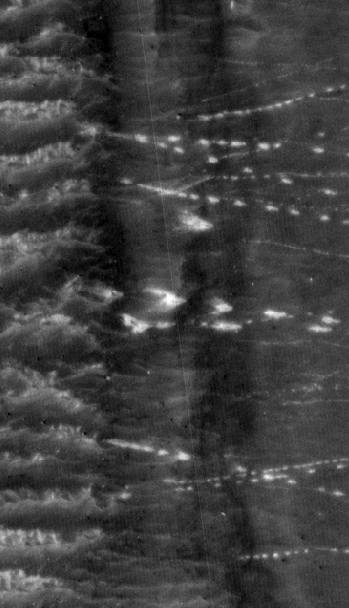 This strange image was captured by the Mars Reconnaissance Orbiter’s (MRO) camera–the amazing High Resolution Imaging Science Experiment (HiRISE)–as it passed over one of the largest volcanoes in the Solar System, Pavonis Mons. Located near the equator of Mars, atop the Tharsis bulge, Pavonis Mons is the second highest volcano after the huge Olympus Mons (towering over the Martian surface 27 km high). Pavonis Mons is still much higher than anything the Earth can muster, towering 14km into the atmosphere (compare that with the altitude of Mt. Everest’s peak height of 8.85 km). So why is this picture so blurry? Is HiRISE suffering a malfunction? Did mission control send the wrong commands? Actually, HiRISE is working just fine. It’s the dust-covered surface that’s blurred. As the ancient volcano is reaching so high into the Martian atmosphere, the air becomes very thin. The atmosphere was already thin; the average ground level atmospheric pressure is less than 1% of the Earth’s. At Pavonis Mons’ peak, the atmospheric pressure is ten-times thinner. Therefore any wind at these altitudes is extremely weak. The extreme planet-wide dust storms that regularly engulf Mars dump huge quantities of dust on the top of the Martian volcanoes, but when the dust settles, there’s nothing to transport it elsewhere. Therefore, the thick layer of fine material remains where it is, tickled by the light-weight winds, rarely moving. 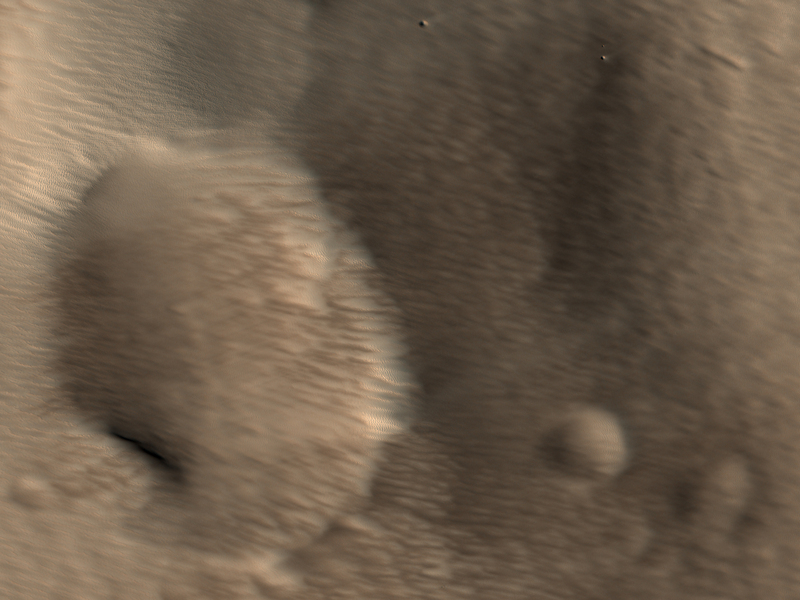 For more, check out The Blurry Summit of Mars’ Pavonis Mons on the Universe Today. Frosty Phoenix Not Snowed Under… Yet. Although there was some excitement about the possibility of reviving the lander next summer, it is highly unlikely Phoenix will be in an operational state, even if it did have an abundant source of light to heat up its solar panels once more. No, Phoenix is dead. 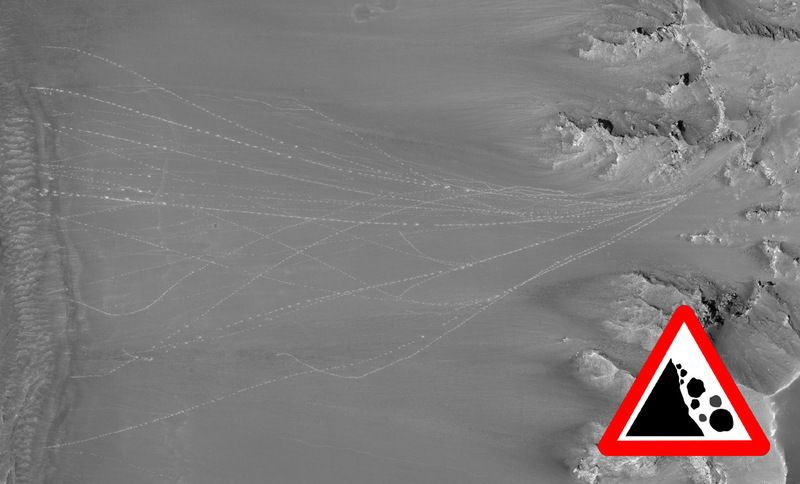 Author Ian O'NeillPosted on January 2, 2009 Categories MarsTags AstroPhoto, HiRISE, Mars, Mars Reconnaissance Orbiter, MRO, Phoenix, Snippets!1 Comment on Frosty Phoenix Not Snowed Under… Yet. If there’s one instrument that should get the Mars Orbiting Science Award of 2008 it’s the High Resolution Imaging Science Experiment (HiRISE). Flying on board NASA’s Mars Reconnaissance Orbiter (MRO), HiRISE has been taking some astonishing imagery of the Martian surface since 2006. 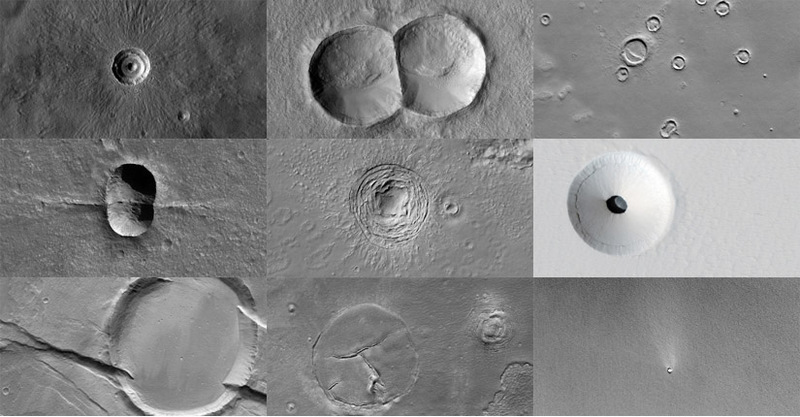 In fact, the HiRISE image gallery has become the staple of my high resolution Mars photo collection, and the studies being carried out by this fantastic instrument have formed the basis of many articles.